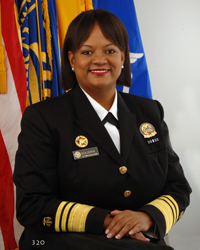 Regina Benjamin, M.D., United States Surgeon General, will deliver the commencement address to more than 500 graduates of the Spelman College class of 2013 and receive an honorary degree on Sunday, May 19 at 3 p.m. at the Georgia International Convention Center. In addition to Dr. Benjamin, honorary degrees will be presented to Freeman Hrabowski, III, Ph.D., president of University of Maryland, Baltimore County, and Harriet Mitchell Murphy, C’49, retired judge for the State of Texas. “As an accomplished medical professional whose top concern is the health and wellness of the nation and American citizens abroad, Dr. Benjamin is an exemplary role model for Spelman students.” ~ Spelman President Beverly Daniel Tatum, Ph.D.
“America’s Doctor” Regina Benjamin, M.D., United States Surgeon General, will deliver the commencement address to more than 500 graduates of the Spelman College class of 2013 and receive an honorary degree on Sunday, May 19 at 3 p.m. at the Georgia International Convention Center. A medical trailblazer, Dr. Benjamin was the first physician under age 40 and the first African-American woman to be elected to the American Medical Association Board of Trustees in 1995. She was also the first African-American female president of a state medical society in the United States when she assumed leadership of the Medical Association State of Alabama in 2002. From her early days as the founder of a rural health clinic in Alabama ─ which she kept in operation despite damage and destruction inflicted by hurricanes Georges in 1998 and Katrina in 2005 and a devastating fire in 2006 ─ to her leadership role in the worldwide advancement of preventive health care, Dr. Benjamin has forged a notable career dedicated to service. In addition to Dr. Benjamin, honorary degrees will be bestowed upon Freeman Hrabowski, III, Ph.D., president of University of Maryland, Baltimore County, and Harriet Mitchell Murphy, C’49, retired judge for the State of Texas. The Rev. Dr. Joseph Echols Lowery, civil rights advocate, will receive the National Community Service Award. Freeman Hrabowski, III, Ph.D., president of University of Maryland, Baltimore County, will receive an honorary degree. For nearly 20 years, Dr. Hrabowski has been focused on increasing the number of African-American students in science, technology, engineering and mathematics ─ and nearly half of the student body at his institution major in STEM areas. Harriet Mitchell Murphy, C’49, will receive an honorary degree. In 1973, Judge Murphy was appointed to the Austin Municipal Court as the first African-American woman to be appointed to a judgeship in the State of Texas. She rose to become presiding judge of this court where she adjudicated thousands of cases before her retirement in 1993. Presidential Medal of Freedom honoree, the Rev. Dr. Joseph Echols Lowery, will be recognized with the National Community Service Award. Often referred to as “Dean of the Civil Rights Movement,” the Rev. Dr. Lowery is a longtime advocate for human rights, dating back to Alabama in the 1950s, the founding of the Southern Christian Leadership Conference (SCLC) in partnership with Dr. Martin Luther King, Jr., and as a preacher across the decades. Mercy Amba Oduyoye, Ph.D., director of the Institute of Women in Religion and Culture at Trinity Theological Seminary in Ghana, will serve as baccalaureate speaker to the class of 2013. Dr. Oduyoye is a scholar, author and professor of religion known for her work in African women’s theology. 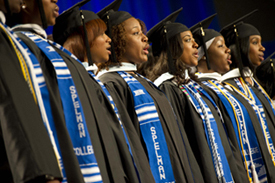 Baccalaureate service will be held on Saturday, May 18 at 9 a.m. on the Spelman Oval. Founded in 1881, Spelman College is a highly selective, liberal arts college widely recognized as the global leader in the education of women of African descent. Located in Atlanta, Ga., the college’s picturesque campus is home to 2,100 students. Outstanding alumnae include Children's Defense Fund Founder Marian Wright Edelman; Sam’s Club CEO Rosalind Brewer, Broadway producer Alia Jones, Former Acting Surgeon General and Spelman’s first alumna President Audrey Forbes Manley, Havard College Dean Evelynn Hammonds, Author Pearl Cleage and Actress LaTanya Richardson Jackson. For more information, visit http://www.spelman.edu.